Hello folks, just a quickie to give you advance notice of two events that I’m involved in over the next few days. 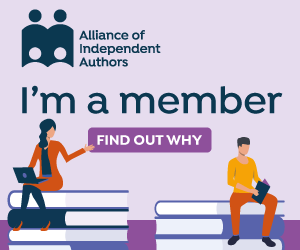 On Saturday 22nd October at 6pm, my talk in the autumn Indie Author Fringe Conference will be broadcast online by the Alliance of Independent Authors (ALLi), which hosts this fab series of free online conferences that you can join in wherever you are in the world. ALLi runs three conferences each year, to coincide with the world’s biggest book trade events – the London Book Fair, Book Expo America and the Frankfurt Book Fair. The Frankfurt Book Fair is currently in full swing, and the IAF Conference will run for 24 hours from Saturday through to Sunday, starting at 10am Frankfurt time. My talk will be at 6pm on Saturday 22nd October on the topic of “The Best Day Jobs for Authors”. and I’m including advice from lots of fellow ALLi authors as well as drawing on my own experience. Click here to find out about the full programme and how to join the Fringe live online as it happens, visit this page. I’m delighted to have been invited to give my first ever live reading on BBC radio of one of my short stories, The Alchemy of Chocolate. I’ve been invited to read this particular one as part of a piece promoting Stroud Short Stories,because it was the same story that I read at the April 2015 SSS event and also at SSS’s Cheltenham Festival of Literature event last Monday. (I’ll be posting separately about that once I have photos . Event organiser John Holland will be in the studio with me on Monday 24th October on the lunchtime show at 12noon, and he’ll be reading some of his stories too, which are always compelling and often very funny.) Tune in here. “The Alchemy of Chocolate” is one of the stories in my flash fiction collection Quick Change, and it’s also available as a free download for anyone joining my Readers’ Club, which means I’ll send you news of new books, events and special offers, plus a free short story with every enewsletter. Just click here to sign up. In the meantime, if you’d like to catch the October BBC Radio Gloucestershire Book Club broadcast, featuring Caroline Sanderson, Associate Editor of The Bookseller, and me, talking books with presenter Dominic Cotter, you can do so here – it starts an hour into the show. No prizes for guessing what this month’s read was – as you can see from the photo, we got into the spirit of it, raiding our wardrobes for purple. Caroline even managed to rustle up a raspberry beret! We like to think Prince would have approved.